How and Where to Buy Cantharone Online? Our online pharmacy here at www.CanadianPharmacyWorld.com carries an over-the-counter (OTC) version of Cantharone, and a stronger prescription only dosage of both the brand name and its generic equivalent. If you have questions, check out our FAQ or if would like to speak to someone about your order, please dial 1-866-485-7979 and someone will be able to assist you. Are there Alternative Names for the Brand and Generic Cantharone? Cantharone is the brand name medication manufactured by Dormer Laboratories. Its generic equivalent is known as Canthacur manufactured by Paladin. What Dosages and Forms is Cantharone available in? Here at Canadian Pharmacy World, we carry an OTC dosage of 0/7%/7.5 ml bottle of the brand name Cantharone. We also carry brand name prescription only Cantharone Plus (Cantharidin/Podophyllin/Salicylic Acid) in a 1%2%/30%/7.5 ml dose and the generic equivalent, Cantharidin Plus (Catharidin/Podophyllin/Salicylic Acid) in a 1%/5%/30%/7.5 ml dose. Each are shipped from our Canadian pharmacy. What is Cantharone used for? 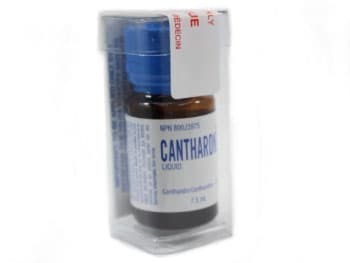 Cantharone is a topical treatment used for removing corns, plantar warts, molluscum contagiosum and periungal warts, and common warts without scarring. It’s considered a painless blistering agent, and it’s used as a destructive agent to blister off the unwanted skin growth. Its painless nature makes it especially useful when treating children. What are the Possible Side Effects of Cantharone? Though Cantharone is considered to be painless, it can cause irritation to the skin around the treated area. Because this treatment is topical, its side effects are generally quite mild and may include skin tenderness around the treated site, itching, and/or burning. Broken skin may be susceptible to infection, if not monitored properly. Proper care of the treated site is important. Are there any Precautions and Drug interactions of Cantharone? Cantharone is mean to be a topic treatment only. It should not be applied to moles, birthmarks, warts with hairs growing in them, or anywhere near the genital area. There are no known interactions with Cantharone. Consult your doctor or pharmacist to discuss whether or not Cantharone is right for you. Store Cantharone at room temperature, away from heat, direct light, and moisture. Do not ingest Cantharone, as it can be fatal. If you suspect ingestion or overdose, seek immediate emergency help or call Poison Control at 1-800-463-5060.